I think this a great poster! I especially like the the word ‘irreplaceable’ – we all share this amazing planet, the only home we’ll ever have. We must take good care of it. 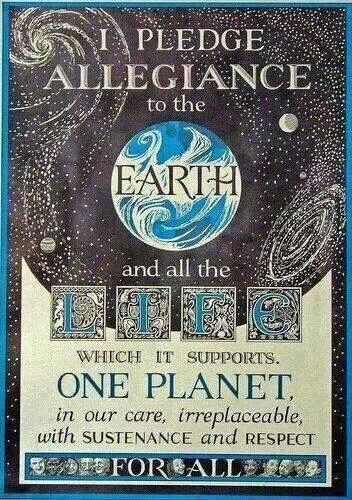 3 Responses to Pledge for mother Earth. Beautiful- what a way to transform our thinking! Hmmm, can you imagine if we had little kids memorize that one instead of the one to the flag? Don’t get me wrong, I’m no anarchist, but to plant the idea that we are ALL one cohesive whole and there really are no boundaries in the world save illusional, divisive, manmade ones.